After four days of tough poker featuring some of the biggest names in the world, the final nine players returned to the poker room at the Crown Casino in Melbourne for the final table of the 2008 PokerNews Cup Australia Championships Main Event. 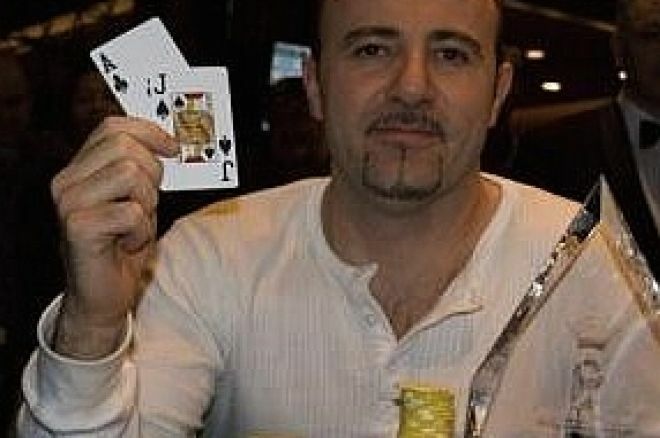 It took a long afternoon and night of poker, but finally Nali "Iraqi Nick" Kaselias defeated Kenneth Damm heads-up for the trophy and the $250,000 first prize. Play started off cautiously, as none of the players wanted to make any mistakes early on. Several orbits into the final table, James Broom got his short stack into the middle of the table, and found a caller in Grant Levy. Broom tabled and held live cards against Levy's . Levy picked up a pair on the flop, and the turn and river didn't bring any help for Broom, as the Melbourne pro headed to the rail in ninth place ($12,000). Levy didn't last much longer, however, as the APPT Sydney champ busted in eighth place ($16,400). Levy moved all in preflop from the cutoff with , and ran into Ray Sukkar's pocket aces in the big blind. No help came for Levy on the flop of , and he was looking for runner-runner help. The on the turn left him drawing dead, and the was the irrelevant river card, as Levy's second consecutive Main Event final table appearance came to an end. David Gorr led as play began, but some early setbacks left him on the short stack and he was busted by eventual champ Nali Kaselias in seventh place ($24,600). Kaselias made a big raise from under the gun, and Gorr thought for a long moment before calling off almost his entire stack. The flop came down , and Kaselias bet enough to put Gorr all in. Gorr called with , and was in deep trouble when Kaselias tabled . Gorr didn't pick up an ace on the turn or river as the rest of the board came down , and his tournament was over. Next, Tim Heath busted in sixth when he ran afoul of Ray Sukkar. Sukkar raised preflop with , and Heath moved all in over the top holding . Sukkar called, and the flop missed both players as it came down . The on the turn was no help to either player, but the on the river was disaster for Heath, as it made a straight for both players, giving the nut straight to Sukkar and sending Heath home with $32,800. Martin Comer became the fifth-place finisher when he tangled with Nali Kaselias in one final big hand. Kaselias raised from the button with , and Comer moved all in over the top with . Kaselias called, and they were off to the races. The flop missed Comer as it came down , leaving Kaselias' eights in the lead. Running sevens on the turn and river spelled doom for Comer, who picked up $41,000 for his tournament run. Ray Sukkar and Kenneth Damm tangled for the last time when Sukkar moved all in over the top of Damm's preflop raise with . Damm quickly called with , and the flop came down . Damm's A-K still led after the turn, and the on the river sent Sukkar packing in fourth place ($49,200) as Damm took over the chip lead with three players left in the field. David Lee made his stand with a pocket pair when he moved all in over the top of Nali Kaselias' preflop raise. Kaselias thought for a long moment before calling with , dominating Lee's . The flop of left Lee drawing to two outs, and the on the turn wasn't one of them. The hit the river, and Lee hit the rail in third place ($73,100) as Kaselias and Kenneth Damm settled in for a lengthy heads-up match. Stacks were close to even as heads-up play began, and it took nearly an hour of one-on-one play before Kaselias moved into the lead and put away his opponent for the trophy and the $250,000 first prize. Kaselias raised preflop in the final hand with , and Damm moved all in over the top with . Kaselias snap-called, and the flop came down gin for Kaselias, as he hit two pair on the board of . Damm was left drawing to runner-runner to stay alive, but the on the turn gave Kaselias a full house and assured Damm a second-place finish ($120,000). The meaningless river ended the event, and Nali Kaselias claimed his championship trophy and its accompanying $250,000 prize money.